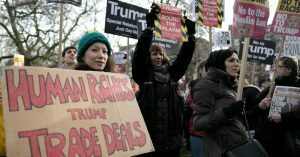 Tens of thousands of people in the United Kingdom have committed to protest during President Donald Trump’s planned visit to London on July 13, with organizers saying a potential post-Brexit U.S.-U.K. trade deal as well as the president’s overall agenda and misogynist, racist rhetoric will drive demonstrators into the streets. London Mayor Sadiq Khan, a longtime critic of Trump’s, promised on social media that demonstrations against the president would be welcomed by the city. The president’s previously planned state visit was scaled back to a working visit earlier this year after 1.8 million Brits signed a petition opposing the event. The petition was circulated amid outrage over Trump’s retweet of an anti-Muslim video posted on Twitter by the far-right fringe group Britain First, an action that drew condemnation from British politicians including Prime Minister Theresa May. London’s demonstration is being planned amid warnings that such protests could harm a potential post-Brexit trade deal between the U.S. and the U.K., with many British people saying they oppose a deal. British food safety experts were aghast earlier this year after the release of a report detailing major safety and hygiene breaches at large meat and poultry plants in the United States. Britain’s Institute for Public Policy Research found recently that 82 percent of the nation’s public would rather abandon plans for a trade deal with the U.S. than lower food standards—a step May has refused to rule out in order to push an agreement through. London has been the site of numerous anti-Trump protests since the president won the 2016 election. Nearly 100,000 were estimated to join the 2017 Women’s March in Britain’s capital, and tens of thousands turned out two weeks later to march against Trump’s proposed travel ban.